Pure lines, straight angles and contemporary style, plus options. The Zora can have an integral front skirt, removable front skirt or ordered without a skirt. All the styles have an integral tile flange that is perfect for shower and tub combinations. 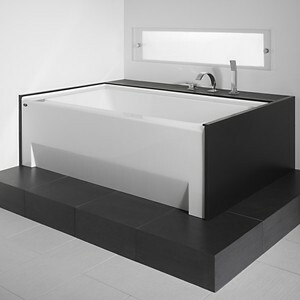 Choose from a soaking, whirlpool, air or combination tub. Tub Size: 65 3/4" x 35 3/4" x 22"
Faucets not included with tub - no holes will be drilled by Neptune. Your installer can place faucets. 13 A Pump, diverter valve.